Here it is, the chapter you've been waiting for! Your Web pages are ready for the world to see, and this chapter explains how to get them to appear before the eyes of your intended audience. The most obvious avenue for publishing Web pages is, of course, the Internet. Yet you may want to limit the distribution of your pages to a local intranet within your organization instead of making them available to the general public. You may also choose to distribute your Web pages on CD-ROMs, floppy disks, Zip disks, or the new DVD-ROM disks. This chapter covers all of these options, and offers advice on designing your pages to work best with the distribution method you choose. New Term: An intranet is a private network with access restricted to one organization, but which uses the same standards and protocols as the global public Internet. To Do: Before you read about publishing your pages, you should give some thought to which methods of distribution you will be using. You probably already know if you're going to be publishing on a corporate intranet, but the decision of whether to publish on the Internet or on disk can be harder to make. If you want your pages to be visible to as many people as possible all over the world, Internet publishing is a must. But don't rule out other distribution methods; you can easily adapt Internet-based pages for distribution on disks and/or local networks. If you want to reach a specific group of people who have computers, but may not be on the Internet yet, publish your pages on floppy disk (if there aren't very many of them) or CD-ROM (if you have an extensive site). But first, consider seriously whether you can present the same information on good old-fashioned paper. If you want to provide very large graphics, multimedia, or other content that would be too slow to transfer over today's modems, consider publishing on a CD-ROM. You can easily link the CD-ROM to an Internet Web site, and offer the CD-ROM to people who find you through the Internet, but want the "full experience." Currently, more people have disk drives than Internet connections. Disks can deliver information to the computer screen much faster than people can download it from the Internet. You can distribute disks to a select audience, whether or not they are connected to the Internet or any particular intranet. In the not-too-distant future, as Web-enabled televisions and high-speed networks become more commonplace, these advantages may disappear. But for now, publishing on disk can be an excellent way to provide a bigger, faster, and more tightly targeted Web presentation than you could on today's Internet. Publishing on 1.44MB floppy disks or 100MB Zip disks is simply a matter of copying files from your hard disk with any file management program. You just need to keep in mind that any links starting with http:// will only work if and when someone reading your pages is also connected to the Internet. The cost is currently about $0.50 per floppy disk, or $10 per Zip disk, plus any delivery or mailing costs. Time Saver: Never use drive letters (such as C:) in <A HREF> link tags on your Web pages or they won't work when you copy the files to a different disk. Refer back to Chapter 3, "Linking to Other Web Pages," for more details on how to make links that will work both on disk and on the Internet. Publishing on CD-ROM or the new DVD-ROM disks isn't much more complicated; you either need a drive (and accompanying software) capable of creating the disks, or you can send the files to a disk mastering and duplication company. Costs for CD-ROM duplication vary a lot depending on how many disks you need. For less than a hundred CD-ROMs, it may cost more than $10 per disk. But for thousands of copies, expect to pay less than $1 each plus delivery or mailing costs. DVD-ROM pricing hasn't settled down yet, but it will eventually be similar to CD-ROM pricing. To make an HTML page part of the publicly accessible World Wide Web, you need to put it on a Web server (a computer permanently connected to the Internet and equipped to send out Web pages upon request). If you run your own Web server, this procedure is simply a matter of copying the file to the right directory. But most people use a Web server run by an Internet service provider (ISP) to host their pages. Almost all service providers that offer Internet access also offer space to place your own personal Web pages for little or no additional cost. However, if you plan (or even hope) to attract large numbers of people, you should pay a little more money to get a fully supported business site with a major Internet service provider. Prices for a business site start well under $100 per month, but you usually pay more when lots of people start viewing your pages. For a site with about a hundred different Web pages, I have paid as little as $40 per month when a few thousand people looked at my pages, and as much as $2,000 per month when hundreds of thousands of people looked at my pages. Just A Minute: One of the most important choices you'll need to make when you set up a Web site is the name you want to use as the address of the site. If you aren't willing to pay $100 up front and $50 a year to maintain your own domain name, the address of your site will include the name of your Internet service provider (example: http://www.shore.net/~smith/). If you're willing to pay for it, you can pick any name that isn't already in use by another company (example: http://mister-smith.com/) You can check to see if the name you want is already in use at http://domain-registration.com/ (Or you can just enter the name in your Web browser to see if you get a page.) Once you find a name that isn't already taken, ask your Internet service provider to help you apply for that name as soon as possible. When a Web server computer sends Web pages to people through the Internet, it uses an information exchange standard called Hypertext Transfer Protocol (HTTP). To upload a page to your Web site, however, you need software that uses an older communications standard called File Transfer Protocol (FTP). New Term: File Transfer Protocol is the standard that your file transfer software must adhere to when sending files to a Web server. The server then sends those files out to anyone who asks for them using the Hypertext Transfer Protocol. Put your username and password for accessing the site instead of myname and mypassword, your Internet service provider's address instead of myisp.net, and the top-level directory where your Web pages reside instead of /home/web/wherever/. 2. 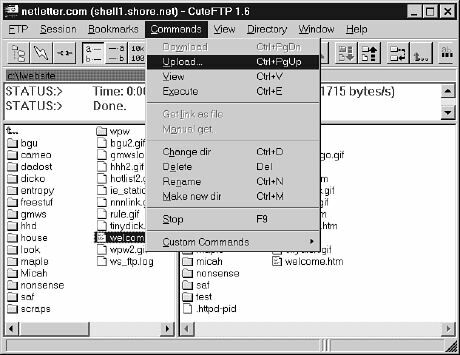 Drag the icons for the HTML and graphics files you want to upload from any Windows 95 file management program (such as Windows Explorer) into the Netscape Navigator window. 3. A dialog box appears and asks you whether you want to upload the files. Click OK, and wait while the files are transferred. 4. 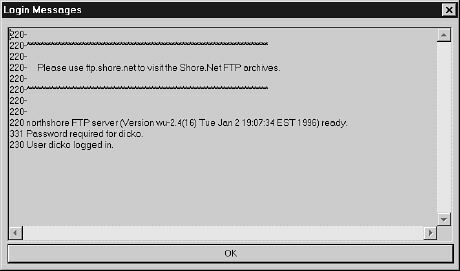 Test your page by clicking on the HTML file you just uploaded in the FTP directory listing (in the Netscape window). You're on the Web! 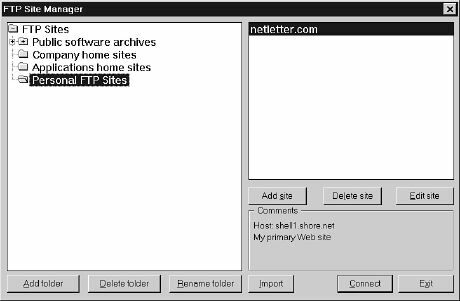 Even though Netscape Navigator 2.0 or 3.0 can send files to any Web server on the Internet, specialized FTP programs such as WS_FTP or CuteFTP offer much more control for managing your Web pages. For example, Navigator doesn't give you any way to delete an old Web page that you want to get rid of, or change the name of a Web page on the server computer. You'll definitely want a specialized FTP program to maintain your Web site. Similar programs are available for Macintosh computers (Fetch is a popular favorite), and FTP utilities come pre-installed on most UNIX computers. You can find these and other FTP programs at http://www.shareware.com. Figure 4.1. CuteFTP is a powerful and user-friendly FTP program that individuals can use for free. To Do: I recommend that you download CuteFTP now and use it to send some files to your own Web site as you read on (if you have a Web site set up, that is). Go to the CuteFTP home page at http://www.cuteftp.com/ and follow the Download CuteFTP links. Once the download is complete, run the self-extracting .exe program, which will install the CuteFTP program. 1. Before you can access the Web server, you must tell your FTP program its address, as well as your account name and password. In CuteFTP, select a category for your site in the FTP Site Manager window (Personal FTP Sites in Figure 4.2), and click Add site to access the FTP Site Edit dialog box in Figure 4.3. Figure 4.2. CuteFTP includes an intuitive FTP Site Manager, though most Web page authors only need a single FTP site entry. Figure 4.3. Clicking on Add site or Edit site in Figure 4.2 brings up this dialog box. 2. Here's how to fill in each of the items in Figure 4.3. Site Label is the name you'll use to refer to your own site. Nobody else will see this name, so enter whatever you want. Host Address is the FTP address of the Web server that you need to send your Web pages to. This usually (but not always) starts with ftp. Notice that it may or may not resemble the address that other people will use to view your Web pages. The Internet service provider that runs your Web server will be able to tell you the correct address to enter here. User ID and Password are also issued by the company that runs the Web server. Be aware that CuteFTP (and most other FTP programs) will remember your password automatically, which means that anyone who has physical access to your computer may be able to modify your Web site. For the Initial Local Directory, enter the drive and directory folder on your computer's hard drive, where you keep your Web pages. Normally, you won't need to change the Port, Retry, Delay, Max Safe Index Size, and Host Type settings unless you experience problems with your connection. If that happens, have your service provider help you figure out the best settings. You should also make sure that Use firewall and the other check box options are unchecked unless someone in the know says to check them. You can enter any Comments or reminders to yourself that you like. Only you will see them. 3. When you click OK, you'll go back to the window shown in Figure 4.2. Make sure you are connected to the Internet, and click Connect to establish a connection with the Web server computer. Most server computers issue a short message to everyone who connects to them. Many FTP programs ignore this message, but CuteFTP presents it to you as shown in Figure 4.4. It seldom says anything important, so just click OK. Figure 4.4. CuteFTP displays the "boilerplate" message that some server computers send whenever you connect to them. 4. Once you're connected to the server, you'll see two lists of files, as shown earlier in Figure 4.1. The left window pane lists the files on your computer, while the right pane lists the files on the server computer. To transfer a Web page to the server, select the HTML file and any accompanying image files in the left window. (Remember that you can hold down the Ctrl key and click the mouse to select multiple files in any Windows program.) Then select Commands | Upload, as in Figure 4.5, or click on the Upload button on the toolbar. As you can see, the same menu contains commands to delete or rename files (on either your computer or the server), as well as commands to make and change directory folders. Time Saver: Most Web servers have a special name for the file that should be sent if someone doesn't include a specific filename when they request a page. 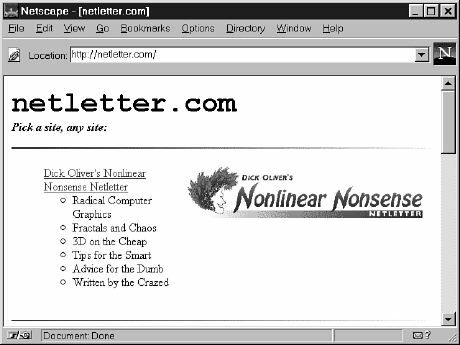 For example, if you go to http://netletter.com/, my Web server will automatically give you the welcome.htm file. Other Web servers use different names for the default file, such as index.html. Be sure to ask your service provider the default filename so you can give your home page that name. Figure 4.5. To send files to the server, select Commands | Upload in CuteFTP. 5. That's all there is to it! In most cases, you can immediately view the page you just put on the Web server using Netscape Navigator (see Figure 4.6) or Microsoft Internet Explorer. Figure 4.6. Most Web servers make pages immediately available on the Internet seconds after you upload them. 6. When you're done sending and modifying files on the Web server, select FTP | Disconnect to close the connection. The next time you need to upload some Web pages, you won't need to fill in all the information in step 2. You can just click Connect, select the pages you want to send, and click on the Upload button. Just A Minute: Most Web servers are set up so that any documents placed onto them are immediately made available to the entire World Wide Web. However, some require that users manually change file permission settings, which control who is allowed to access individual files. Your Internet service provider can tell you exactly how to change permission settings on their server and whether it's necessary to do so. The procedure outlined above for sending pages to a public Internet server is fairly standard. But the internal workings of private corporate intranets vary considerably from company to company. In some cases, you may need to use an FTP program to send files to an intranet server. In others, you may be able to transfer files using the same file management program you use on your own computer. You may also need to adjust permission settings, or make special allowances for the firewall that insulates a private intranet from the public Internet. About all I can tell you here in this book about putting files on your company's intranet is to consult with your systems administrator. He can help you put your Web pages on the company server in the way that best ensures their accessibility and security. Whenever you transfer Web pages to a disk, Internet site, or intranet server, you should immediately test every page thoroughly. The following checklist will help you make sure everything on your pages behaves the way you expected. 1. Before you transfer the pages, follow all of these ten steps to test the pages while they're on your hard drive. After you transfer the pages to the master disk or Web server, test them again--preferably through a 28.8Kbps modem connection, if your pages are on the Internet. 2. Do each of the following steps with the latest version of Netscape Navigator, the latest Microsoft Internet Explorer, and at least one older browser such as DOS Lynx or Netscape Navigator 2.0. 5. Turn off auto image loading in Netscape Navigator before you start testing, so you can see what each page looks like without the graphics. Check your ALT tag messages, then hit the Load Images button on the toolbar to load the graphics and review the page carefully again. 6. Use Microsoft Internet Explorer's Font Size button (the big A on the toolbar) to look at each page at all font sizes, to ensure that your careful layout doesn't fall to pieces. 8. Wait for each page to completely finish loading, and scroll down all the way to make sure all images appear where they should. 9. If you have a complex site, it may help to make a checklist of all the pages on your site to make sure they are all tested. 10. Time how long it takes each page to load through a 28.8Kbps modem, preferably when connected through a different Internet service provider than the one who runs the Web server. Then multiply that time by two to find out how long 14.4Kbps modem users will need to wait to see the page. Is the information on that page valuable enough to keep them from hitting the Stop button and going elsewhere before the page finishes loading? If your pages pass all those tests, then you can be pretty certain that they'll look great to every Internet surfer in the world. This chapter gave you the basic knowledge you need to choose between the most common distribution methods for Web pages. It also guided you through the process of placing Web pages on a Web server computer using freely available file transfer software. Finally, it offered a checklist to help you thoroughly test your Web pages once they are in place. Q When I try to send pages to my Web site from home, it works fine, but when I try it from the computer at work, I get error messages. Any idea what the problem might be? A The company where you work probably has a firewall, which is a layer of security protecting their local network from tampering via the Internet. You will need to set some special configuration options in your FTP program to help it get through the firewall when you send files. Your company's network administrator can help you with the details. Q I don't know which Internet service provider to pick to host my pages--there are so many! How do I choose? A Obviously, you should compare prices of the companies listed at http://thelist.com that provide hosting services, but you should also ask for the names of some customers with sites about the same size as you plan yours to be, and ask them (via e-mail) how happy they are with the company's service and support. Also, make sure that your provider has at least two major (T3 or bigger) links to the Internet, preferably provided to them by two different network companies. Q All the tests you recommend would take longer than creating my pages! Can't I get away with less testing? A If your pages aren't intended to make money or provide an important service, then it's probably not a big deal if they look funny to some people or produce errors once in a while. In that case, just test each page with a couple of different window and font sizes and call it good. However, if you need to project a professional image, there is no substitute for rigorous testing. Q I wanted to name my site jockitch.com, but Proctor and Gamble beat me to it. Is there anything I can do? A Well, if your company was named Jockitch, Inc., before Proctor and Gamble registered the word as a trademark, you could always try suing them. (Good luck.) Yet even if you don't have the budget to take on their lawyer army, there may be hope. Many new three-letter extensions for site names will probably soon be approved for use, so you may be able to get jockitch.inc or jockitch.biz (if P&G doesn't scoop you again). 1. How do you put a few Web pages on a floppy disk? 2. Suppose your Internet service provider tells you to put your pages in the /top/user/~elroy directory at ftp.bigisp.net, your username is elroy, and your password is rastro. You have the Web pages all ready to go in the \webpages folder on your C drive. Where do you put all that information in CuteFTP so you can get the files on the Internet? 3. What address would you enter in Netscape Navigator to view the Web pages you uploaded in Question 2? 4. If the following Web page is named mypage.htm, which files would you need to transfer to the Web server to put it on the Internet? 1. Just copy the HTML files and image files from your hard drive to the disk. Anyone can then insert the disk in his computer, start his Web browser, and open the pages right from the floppy. 3. You can't tell from the information given in Question 2. A good guess would be http://www.bigisp.net/~elroy/, but you might choose a completely different domain name, such as http://elroy-and-astro.com/. If you want the link on that page to work, you must also transfer otherpage.htm (and any image files that are referred to in that HTML file). So put your pages on the Internet already!